Here's a little random tidbit about our blog. Would you believe one of our top posts of all time is about Homemade Christmas Gifts? Random, right? Well, just in case you landed on this here blog looking for affordable ways to make someone's holiday, here are some more little homemade Christmas gift ideas I have been working on this year. Of course, I will be baking my tail feather off. That goes without saying. But, also, I'll be giving some of these things to friends and family this year. This one is Chai Tea Mix. You can get the recipe and instructions if you click on the link. Here's the bottom line, all you need is some spices and other ingredients. You can get that kind of stuff on the cheap if you look at the Dollar Tree and Aldi. I found cute little jars at the Dollar Tree and at Ikea. Follow the instructions, pour the mix into the jars using a funnel, so it lands in there all pretty like, and tie some cute labels around it. Bam. Cute, cheap Christmas present! I also made Pumpkin Spice Hot Chocolate. Note, if you use this link, they forgot powdered sugar. Add half a cup of that to each batch you make. TRUST me. I got these cute little tags in the Christmas wrapping paper section of Target, and wrote what the mix was, on the plain white back of the tags. 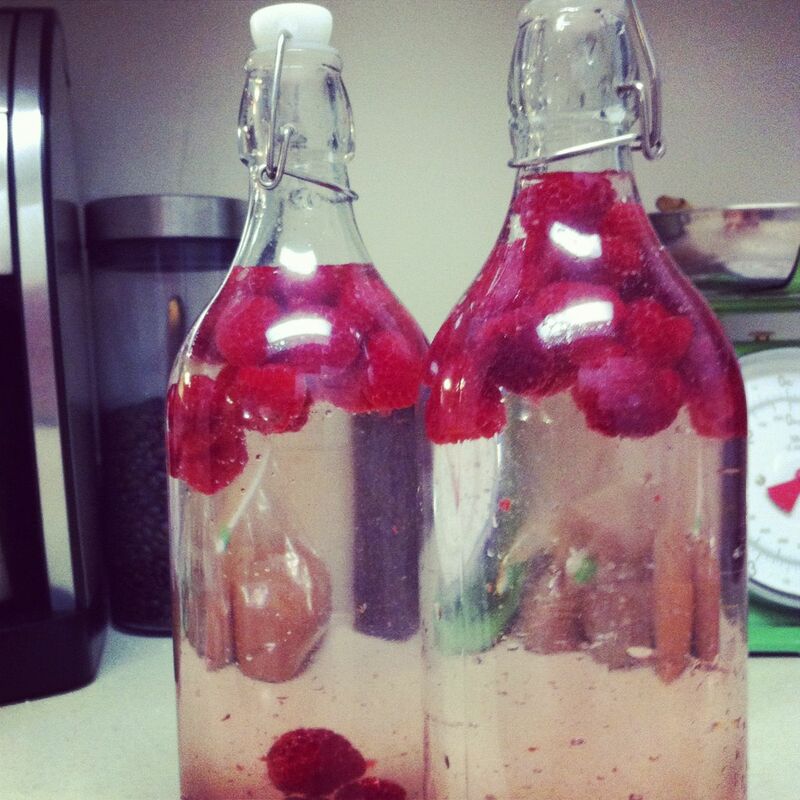 I think my favorite homemade Christmas present I've made so far this season is Raspberry Vinegar. I just mixed it up last weekend, so it's still in process, but I think it's going to be really neat. I took this picture when I was making it last weekend. It's been in our pantry for a week, and it's already WAY red! VERY pretty! This was easier than the drink mixes. All you do is rinse some fresh raspberries, put them in a bottle, then fill it with white distilled vinegar. Then, put it in a cool dark place for 2 weeks. I got the bottles at Ikea. So many cute bottle/jar options there. 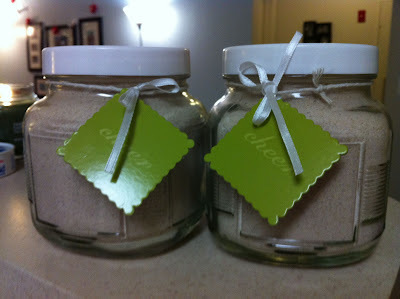 As you see, I also used some Mason canning jars, so no worries if you don't have an Ikea in your neck of the woods! 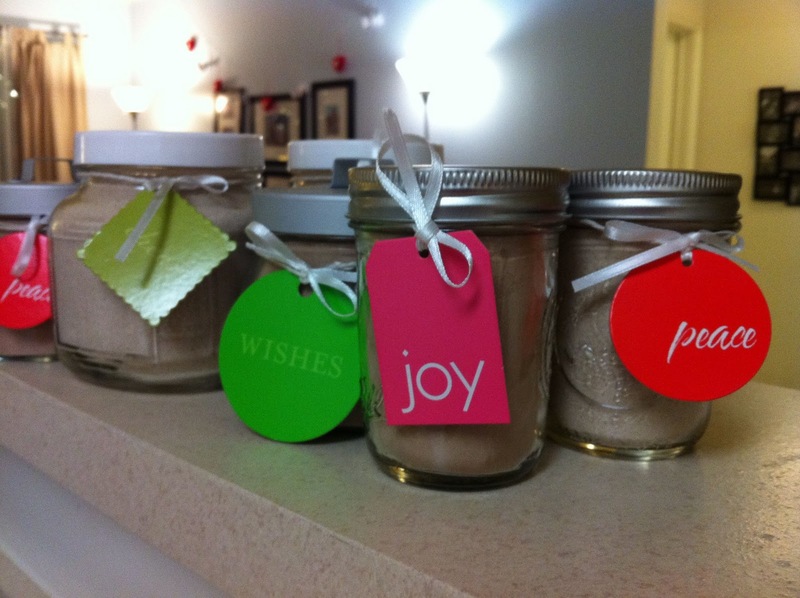 Have fun making your homemade Christmas gifts, and let me know if you have any cute ideas! I love making homemade gifts, and even though we did have a little money to actually spend on Christmas gifts for our families this year, I still like giving some stuff that has that homemade touch. LOVE these! How on EARTH do you have time to do this kind of thing?! 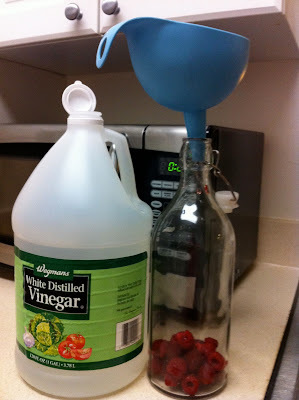 What are some uses for the raspberry vinegar?